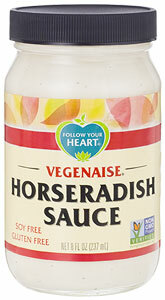 Excite your tastebuds with this mouthwatering vegan Horseradish Sauce! Blending the perfect burst of zest with the creaminess of heart-healthy Soy-Free Vegenaise, it’s the perfect sandwich topper for those who like a little kick with their condiments. 8 fl. oz. (237ml) jar is $4.49.